The first is the water-drop notch as they call it. The notch now is less intrusive and also gives you a very immersive experience to your phone. But with the new design the front side of the camera has seen a redesign in many ways. For instance, the camera is the only part that is featured here and the speaker has moved further up on the bezel. The design though is nice and it gives a much better experience when you are surfing the Internet and also watching videos compared to the OnePlus 6. The 6T is now slightly bigger in terms of size as compared to the 6 and features a 6.41-inch screen. The bottom bezels have been pushed back a little in order to make the screen much bigger. But this also means that the phone has become more heavier and slightly bulkier than the 6. But the change can't just be attributed to some of these cosmetic changes. There is a lot that has changed under the hood as well. Like the phone now features a bigger battery with a 3700 mAh capacity as compared to the 3300mAh in the OnePlus 6. Which is great since the 6 already had a good battery life and now it has gotten much better with the 6T. And the Dash fast charging indeed makes life a bit easier. With the battery being bigger and more powerful, the headphone jack has been completely ditched this time. This isn’t much of a surprise to me honestly since the company moved to the wireless bullet headphones last year, it was evident that at some point of time this was going to happen. And this means that now you get an apple like USB-C connector for your headphones in the box. And Oneplus has said that it was because of the bigger battery that they couldn’t have the headphone jack in the phone. Now that the headphone jack is out of the way,the 6T also becomes the first OnePlus to use the fingerprint sensor under its screen. This means that the sensor from the back is gone and this makes the design look really beautiful and clean as compared to the 6. Personally I am not a big fan of the fingerprint reader on the back. Its just makes the design look very congested. The finger print sensor has 3 new animations when you try and unlock the phone and I really wish these would’ve been better. In terms of performance, the fingerprint sensor works all right. It’s definitely not as fast as the one on the back of the 6. But as a first attempt, it is pretty good. And more importantly, it is innovating and gives something new to the user. You can still unlock the phone using the Face Unlock feature which continues to run pretty fast. There is no difference between the cameras of the 6 and the 6T. They feature the exact same cameras on the back, which are the 16-megapixel and 20-megapixel f/1.7 cameras. Usually the cameras in every smartphone works with a combination of hardware and software and in the 6T the performance of the camera is enhanced with software advancement. A new feature called "Nightscape”, is part of the camera app now and that makes the pictures less blurry in low-light which works in combination with software. And if you are a OnePlus 6 user then fear not, this feature will be available as part of a free software upgrade for you as well. In terms of the performance this feature didn’t make much of a difference to the pictures that we shot. Yes, the images very slightly less blurry but the fact that you have to hold the phone still for a very long time for the images to get captured, isn't really the best experience. In the images that we have shot we have clicked the images with and without the software update. We have a OnePlus 6 which we have updated to the new release and it doesn’t have a night mode. And you can tell the slight difference in the images. The camera also comes with the studio lighting and OnePlus says that in the 6t, it has made an effort to make the images much more true to life and neutral in nature. There is also a studio lighting feature now which is supposed to give a more even light to the images that you click, especially in the selfie mode. One of the best things that I like about the OnePlus phones is that it gives you a near stock android performance. And the 6t is also the same. It’s powered with the Andriod Pie version and as usual it performs super fast. I also like the new navigation gestures in the phone and also the new about screen menu, which is a refreshing change since it gives all the info in a much more organised manner. The performance of the phone is really quick and is very seamless with the new update. You can toggle between apps super fast and also move around a lot. So what are my overall thoughts about the phone? In simple words, it truly is amazing. It's fast, innovative, and gives you a great performance. It has taken all the good things it did with the 6 and has added substantial upgrades to the phone. Yes there is no headphone jack, but I think you should be used to it by now because all the smartphones might move in the similar direction in future. And the best part is that the company has stuck to their smart pricing principles and has placed 6t in a very accessible place , by just increasing the price slightly. So if you are a OnePlus 6 user and have that extra cash to spare then it might as well be an upgrade, that is worth it. 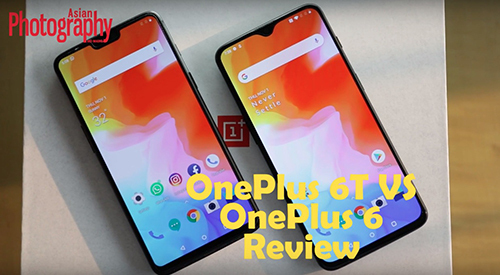 But if you are a new user and are looking to buy an android phone then the OnePlus 6 is definitely the phone for you.